We are compiling a repository of datasheets characterizing the performance of MechBlocks along with fixtures and motion control mechanisms produced from them. Below is general information on how MechBlocks work, performance characteristics of a selected motion control device, and stability of block components. Contact us for more detailed information. Click here to watch a video on how MechBlocks work. Figure 1(a) and 1(b) shows an assembly used to clamp two leaf springs between two structural blocks and a clamping block. In the exploded view you can see that two thread inserts (T11-1-M4) are used as threaded mounting locations. These thread inserts can be positioned in multiple orientations, allowing you to place a mechanical attachment point in any orientation and location within the blocks. Bolts are secured into the cross dowel to hold the assembly together. Another simple example is shown in Figure 1(c) and 1(d). This shows how blocks can be combined while countersinking attachment bolts within the structure by using half-round washers (W11-1-M4). This enables rigid structures to be constructed in a smaller footprint without hardware getting in the way. The best way to see how MechBlocks work is in person, so contact us for a demo. Right now many of our YouTube videos show the previous generation MechBlocks, but we will be releasing new videos soon. Subscribe to our YouTube channel to stay up to date! Figure 1: Diagram of two simple assemblies and their respective exploded views; (a) and (b), (c) and (d). The folded compound linear translation stage is a variant of the simple four-bar arcuate translation stage. It consists of two separate four-bar stages, one nested around the other. By producing an identical second stage, the arcuate motions can be nearly eliminated, thus enabling for an ultra-linear, smooth-continuous, flexure translation mechanism. This device provides 8 mm of motion which is limited only by the yield strength of the flexure springs. By using thinner, more compliant springs (or bidirectional movement), this range can be increased significantly. Click here to view an image of the translator used for this error analysis. Defining the x-axis as the primary direction of motion the roll, pitch, yaw, straightness in y, and straightness in z were measured using an Optodyne LDDM laser interferometer and two DTM22 Lion Precision capacitance gages. These errors were also measured for two commercial precision motion stages; one with crossed roller bearings and one with ball bearings. Plots of the errors for each mechanism are shown in Figure 2 through Figure 6. In addition to plotting the errors, the standard deviation of the linear fit for each error is included in the plot legends to provide information on the linearity of translation errors. The results in Figure 2 through Figure 6 show the folded compound linear translation stage displays larger pitch and roll errors, but comparable yaw, y-straightness, and z-straightness errors to the commercial precision crossed roller and ball bearing stages. For the angular deviations, the folded compound translation stage had errors with higher linearity. For the straightness deviations, the translator had errors that exhibited repeatable arcuate motions. In contrast, the commercial crossed roller and ball bearing stages exhibited motions with no apparent systematic component that in practice can be difficult to predict or compensate. Figure 2: Plot of roll (rotation about the x-axis) for the three mechanisms. The folded compound linear translation stage has the largest total roll error, but this error had the highest linearity (lowest standard deviation). Figure 3: Plot of pitch (rotation about the y-axis) for the three mechanisms. The folded compound linear translation stage has the largest total pitch error, but this error had the highest linearity (lowest standard deviation). Figure 4: Plot of yaw (rotation about the z-axis) for the three mechanisms. The folded compound linear translation stage has a total yaw error and linearity comparable to the crossed roller and ball bearing stages. Figure 5: Plot of y-straightness (deviation in the y-axis) for the three mechanisms. All three mechanisms have comparable straightness errors and measured linearity. Figure 6: Plot of z-straightness (deviation in the z-axis) for the three mechanisms. All three mechanisms have comparable straightness errors and measured linearity. 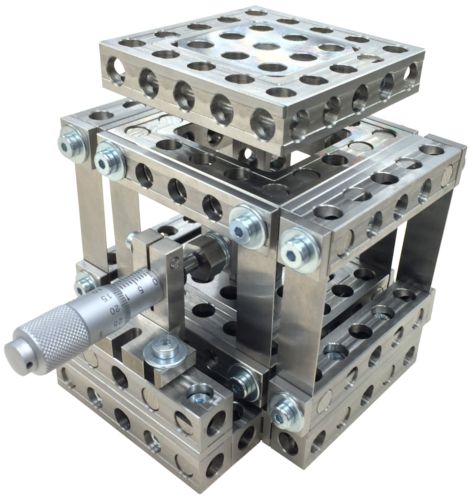 To experimentally measure and evaluate the thermal stability of mild steel MechBlocks, a u-frame was constructed from two 5 x 5 blocks and three 5 x 1 blocks. Figure 7 shows a plot of the displacement measured using the Lion Precision DTM-22 capacitance gage mounted in the u-frame and the corresponding temperature over a 20 hour testing period. Figure 8 displays a plot of the displacement versus the temperature, which should show any temperature related hysteresis. Using the frame geometry and the measured 97.8 nm/°C displacement-temperature fit (as shown in Figure 8), the coefficient of thermal expansion of mild steel MechBlocks was calculated as 13.47E-6 m/m°C. Figure 7: Plot of temperature and capacitance gage measurement over 20 hour testing period. Figure 8: Plot of temperature versus capacitance gage measurement of data shown in Figure 7. The u-frame that was used for testing thermal stability was also used to evaluate the stiffness of fastened block interfaces due to applied bending moments. Calibrated masses were suspended from the free end of the u-frame and frame distortion was measured. Figure 9 shows a plot of the angular deflection of the frame versus applied bending moment. The average joint stiffness was calculated to be 24.6 kN•m/rad. There was no measured hysteresis. Figure 9: Applied bending moment versus block interface joint rotation.